To name a bar after a giant champagne bottle may be seen to be aspirational - especially when the venue used to be a storage room. 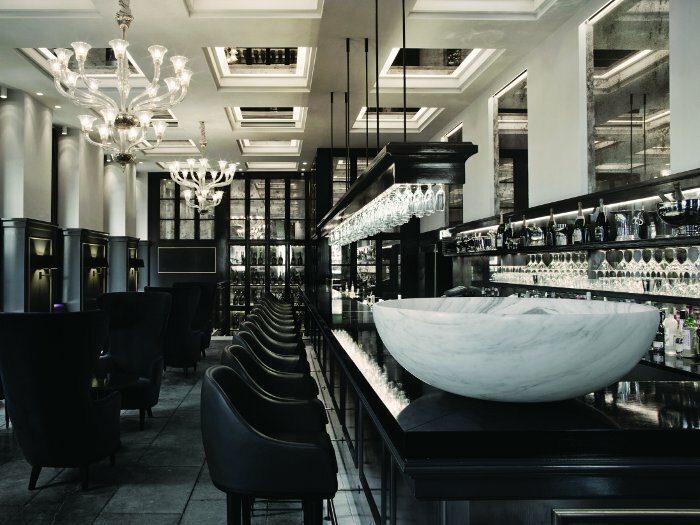 But the now luxurious setting is far from the dark and featureless space it used to be at the back of a hotel, and the new Copenhagen bar Balthazar is more than justifying its luxury-linked name. The Hotel D'Angleterre has held a premiere position in Copenhagen for more than 250 years, once staging debut performances of music by the composer and conductor HC Lumbye, and hosting events for the most the capital city's most prestigious citizens. 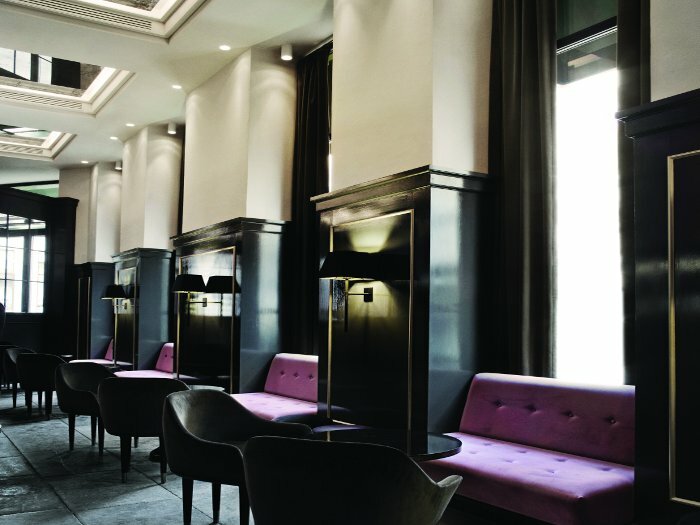 And now, thanks to Peter Bundgaard Rützou and Signe Bindslev Henriksen of Space Copenhagen, the hotel has a stylish bar to match its grand reputation. The pair describe themselves as being 'between the disciplines' of design, meaning that they are interested not only in the structural aspects of the space but also in the interior decoration - and they bring the luxurious champagne-feel to both. Given the bar space's humble beginnings, the architects found it demanding to reconstruct. They opened up the facade and removed a half floor to reveal the high windows and ceiling, now very much features of the bar. The strongest architectural element of the space is inarguably a row of column supports, now highlighted by the interior design that literally mirrors their rhythm on to the facing walls and ceiling. 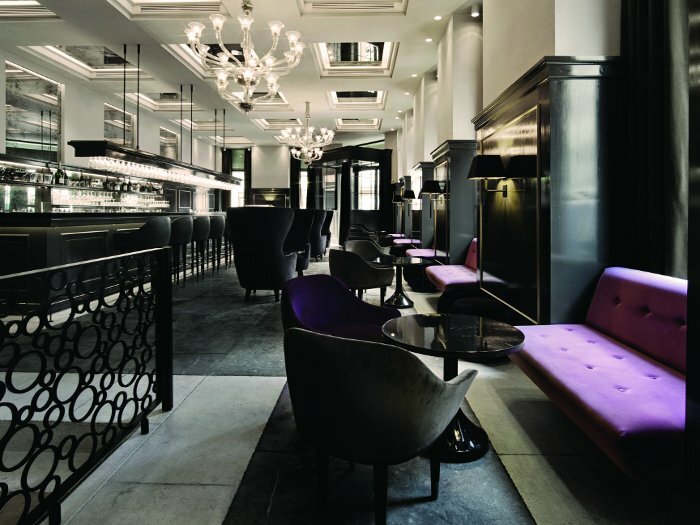 To capture the hotel's 'seductive, poetic and playful approach' handmade vintage mirrors reflect a long black lacquered counter, soft purple and warm-grey velvet upholstered chairs and - as a physical representation of the bar's name - a floor-to-ceiling champagne cabinet, fitted with antique mirrors and brass frames. To top it all off, Venetian Barovier chandeliers in golden glass, 'acting as huge champagne-sculptured clouds that tie the space together', hang overhead. The bar's chairs and lounge chairs were designed by Space Copenhagen for Stellarworks' Lunar collection. 'We do a lot of industrial design, and that approach goes back to Scandinavian designers working in the Forties and Fifties. If you look at Arne Jacobsen, he would do the structural elements but he would also do the door handles and the lamps. That gives the project a completeness that we're attracted to.' We'll drink to that.